Want to improve your community? 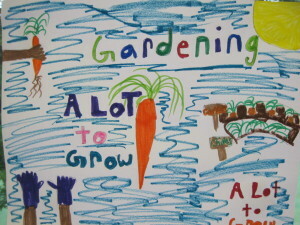 Enlist the help of third graders inspired by speakers from community organizations including A Lot to Grow community gardens, the United Way of Northern NJ, Bike & Walk Montclair, and PAWS. Dana Rose, Meghan Schorr and Maurine Toth, third grade teachers at Montclair Kimberley Academy, implemented an innovative Social Studies lesson plan this year designed to teach youngsters how to be agents of social change. Following classroom presentations, the students researched a topic they felt passionate about, and then wrote a persuasive letter designed to positively impact the community. Amira was stirred to action by the comments of Patrice Kelly, MLitt., Director of A Lot to Grow, who focused on the relationship between local food insecurity and the A Lot to Grow mission. Kelly engaged the students by asking how many had home gardens or knew someone who did; how many had shared a garden experience with family and friends; questions about fresh vegetables; what students understand about food shopping, food pantries, and problems people might have in trying to gain access to food in general and to specifically to fresh vegetables. All of the produce grown in six A Lot to Grow community gardens in Glen Ridge, Montclair and Nutley is delivered to local soup kitchens and food pantries. To date, this volunteer-driven initiative has grown and donated more than 7,400 pounds of vegetables and herbs.